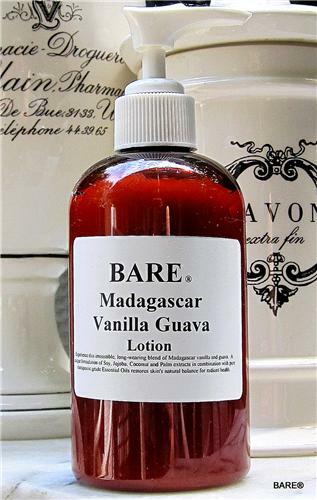 BARE Madagascar Vanilla Guava Peach Hand & Body Lotion - . Experience this irresistible, long-wearing blend of passion fruit, guava, and peach nectar steeped in a warm base of sandalwood and Madagascar vanilla. This love-attracting scent is uniquely infused with a romantic blend of powerful aphrodisiacs prized for their seductive properties. Extra thick and rich Shea & Aloe lotion. Fortified with Aloe, Shea Butter & Natural Oils. Silky-smooth, paraben free lotion that quickly melts into skin to restore softness and hydration. Perfect for normal and dry skin to soothe for all-over skin care; moisturize, soften, nourish, and replenish. Also high in glycerin, this lotion absorbs in quickly while providing long lasting moisture. Replenish natural skin oils and hydrate while protecting from dry skin, flaking and itching. Natural anti-inflammatory and antibacterial properties heal dry skin and super-moisturize. Vanilla and Passion Fruit combine for a refreshing, uplifting fragrance.